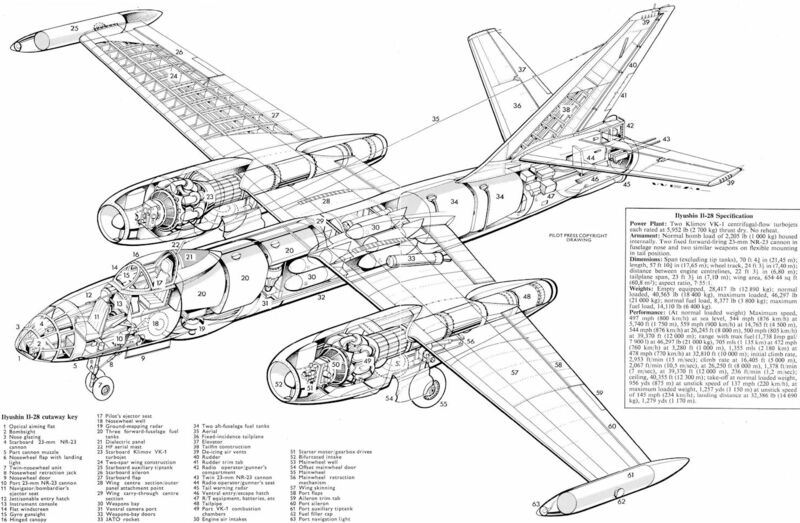 Still serving in some numbers with the AV-MF, the Il-28T is illustrated by this recent photograph. 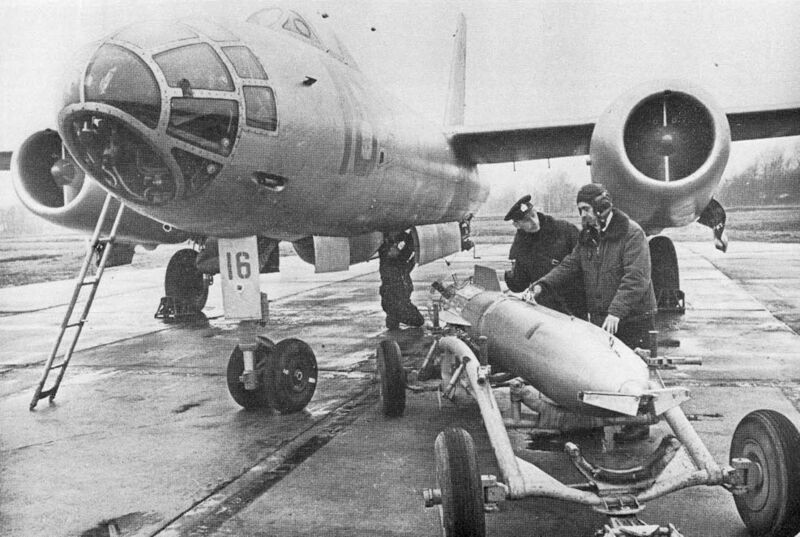 Although Finland’s air arm, Suomen Umavoimat, never acquired the Ilyushin Il-28 for operational tasks, two examples of this aircraft were obtained for the target-towing role, these being flown by the Transport Squadron, or Kuljetus laivue, at Utti, which also possesses a target-towing commitment, and one of these is illustrated here. The Indonesian air arm, Angkatan Udara Republik Indonesia, received some 20 Il-28s from the Soviet Union during the Sukarno regime, but since the establishment of an anti-Communist western-orientated government in 1966, no spares for the Il-28s have been forthcoming, and these aircraft, which were operated by No 21 Squadron of the Operations Command, have been grounded. 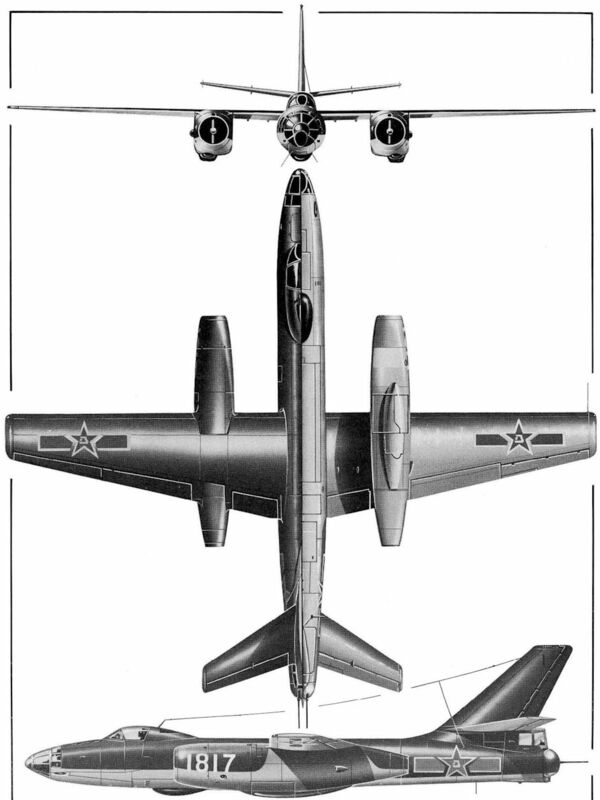 (A) The operational and pilot training Il-28U; (B) the forward fuselage of one version of the Il-28R with tandem ventral radomes; (C) the standard Il-28 with undercarriage extended and entry hatches dotted; (D) the rear fuselage of the standard Il-28 from the starboard side showing offset entry hatch in open position. An Il-28 of the Air Force of the Chinese People’s Republic.